1 teaspoon dried thyme or rosemary or 1/2 teaspoon of each. Prepare a two-zone fire for low heat at 250 degrees F.
In a small bowl mix together the brown sugar, thyme, cayenne, and mustard powder between your finger tips. Pour the nuts into a large disposable foil pan. Add the oil and seasoning. Toss to coat the nuts evenly, and then spread them in a single layer. Add the wood chunks to the charcoal, and put the lid on the grill. When the wood begins to smoke, place the pan of nuts over indirect low heat and cook, with the lid closed as much as possible, until the nuts are toasted and have a nice smoky flavor, 20 to 30 minutes, shaking the pan with tongs a couple times to prevent the nuts from burning. Wearing insulated barbecue mitts, remove the pan from the grill and let the nuts cool completely in the pan. The nuts will become crispier as they cool. Serve at room temperature. 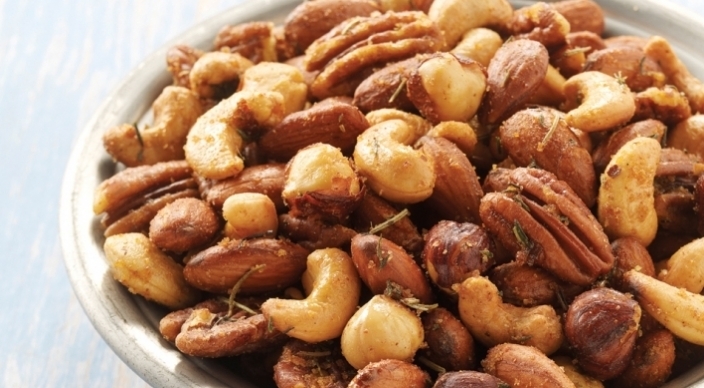 Store any remaining nuts in an airtight container.